So after a year of playing a fairly intense game of catch, you’d more or less completed the scenario for this title. 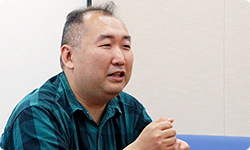 I just wonder, Takeda-san, if there were any particular things you paid attention to when working on the scenario for a video game, given that you usually work on scenarios for TV and films? As I usually work on writing for TV and films, I know that the most effective weapon in the scenario writer’s arsenal is the element of surprise. Certainly, when something surprising happens, it grabs the viewer. Usually, if things go precisely as they had expected, they won’t be moved. Right. That’s why you can say that, to some degree, half hour TV programmes are constructed using the element of surprise and the betrayal of expectations. So you’re saying there are instances where the character - who had been you up until that point - suddenly becomes someone else. That’s just it. I’ve been a gamer for decades now, and I’ve often felt like that. That’s why I didn’t use ‘betrayal’ in that way. I avoided using ‘betrayal’ and ‘the element of surprise’ in relation to the words and actions coming from the hero himself, and decided to use them only in the varying events that occurred in the exterior world. As it was the first time I had the opportunity to be so deeply involved in a single title, I was especially conscious of these issues as I was coming up with the story. Did you talk about that kind of thing with Takahashi-san? No, I don’t think I discussed that with him. As it was the first time I was so deeply involved in a project like this, there were certain rules I’d set myself. Takahashi-san, did you notice that Takeda-san was following this kind of rule? Not in so many words, but we did discuss something similar very early on. 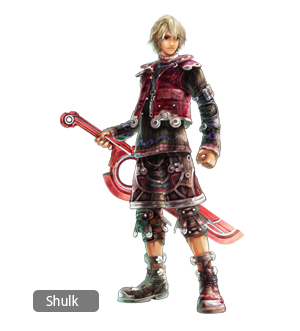 The hero in this game is Shulk, and we made one of our themes that he should be ‘a hero who isn’t hated’. Could you tell me specifically how you set out to achieve that? It’s something I’ve felt about my own games, of course, as well as games by other people. Essentially, the heroes and heroines in RPGs often end up being disliked. Naturally, there are well-loved characters too, but I’d say that in general, they end up being hated. I think it comes from the huge emotional investment the player has made in the hero or heroine. So that’s the flip side of love. Precisely because players care so much about them, this can all too easily turn to hatred. But this time, you set yourself the challenge of avoiding this. Right. We really paid a lot of attention to this issue. Actually, just prior to this interview, I got the staff at Mario Club8 to give me their impressions of the hero, and it turns out that none of them disliked him in the slightest. In fact, they had felt affection towards the hero and his companions throughout. I was incredibly happy when I heard that. 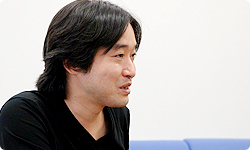 8Mario Club Co., Ltd. performs debugging, testing and so on for Nintendo’s software under development. I’m sure that’s because you’ve made it so the players can be sympathetic to the hero and his companions. 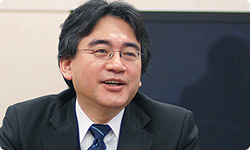 It might seem rather odd to talk about Mario at this juncture, but when I spoke with Miyamoto-san in Iwata Asks about Super Mario Galaxy 2 he said that in all of the games he had worked on up until then, he had aimed to create games that ‘resonate’. I think that the idea of ‘resonance’ relates to what you have been saying about creating a ‘hero who isn’t hated’. Right. Player characters are a part of yourself, and for this reason, they shouldn’t think or do anything that you don’t want them to. With RPGs, there is one way to ensure the hero isn’t hated – and that’s to make it so they don’t utter a word. If they don’t say anything, the player is less likely to feel alienated from them. That’s right. Not making the main character say anything is easy, but for this title, we wanted him to speak. This meant we were groping for a way to get that ‘resonance’. In the end, I think we managed to achieve that to some degree. And now you have the staff at Mario Club telling you that everyone felt affection towards the characters. I really feel we’ve got a very positive response. In fact, this is the first time anyone has ever said something like that to me. So after all the years that you’ve spent making games, you’d say this is the first time where the hero and his companions haven’t been disliked? I think that’s actually true. That’s quite surprising to hear. Takeda-san, what do you think? So you only found this out once you’d already started work on it. Yes, that’s right! (laughs) I found that if you don’t ensure you have a character who is silent, those dialogue scenes become a real pain. I only realised that once work had got started. You’ve got a party, don’t you? That means, for instance, with a party of five, you basically have to have all five members appearing together as you can’t be sure which party member the player most identifies with. It wouldn’t do to just ignore one of them, would it? You can’t just make it so they don’t appear. In a TV or film drama, you could have each of the five members in a separate location and show all kinds of situations. You can then make the story more complex, or change the pace. But with a game, and especially an RPG, all five members of the party basically need to be in the same place. That’s something very particular to games. That means that when there’s a particular event or incident, you need to show how each and every one of them reacts to it. Moreover, because each of the characters has their own individual personality, you have to maintain that personality so that players can continue feeling empathy with them. The way you distinguish the characters, and adjust pace, may well be the biggest difference between anime and games. It was a matter of pure brute force! (laughs) I had no choice but to just write a lot of lines! I see! 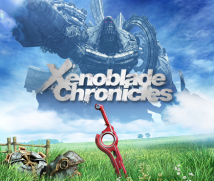 (laughs) So there are no silent types in Xenoblade Chronicles? No there aren’t. So I’d like players to enjoy the dialogue right through to the very end.